The only drawback to this recipe is that removing the spines is a bit of a chore. The first method I tried was with pincers, but that took too long. Then I tried scraping along the surface with a paring knife, and that was a lot faster. The paddle cleaned with the pincers (on the left-hand side) looks better, but once cooked you won’t notice the difference anyway. 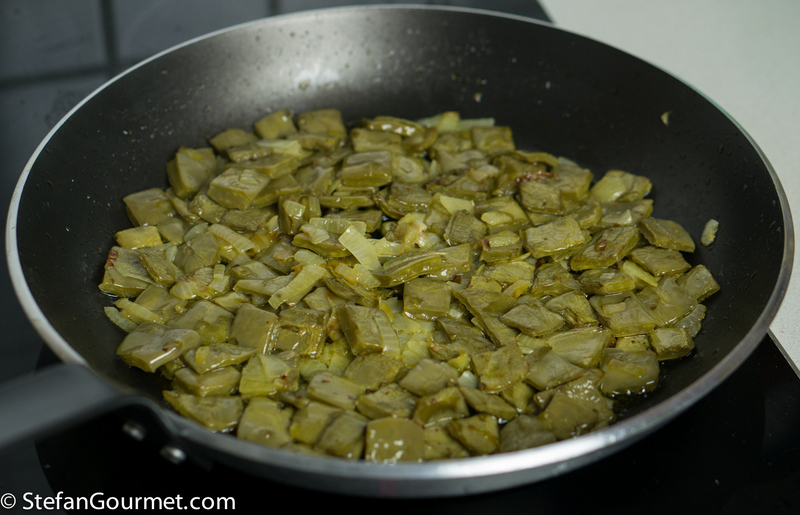 Sauté the cactus paddles with onion in the olive oil over medium high heat for a couple of minutes. 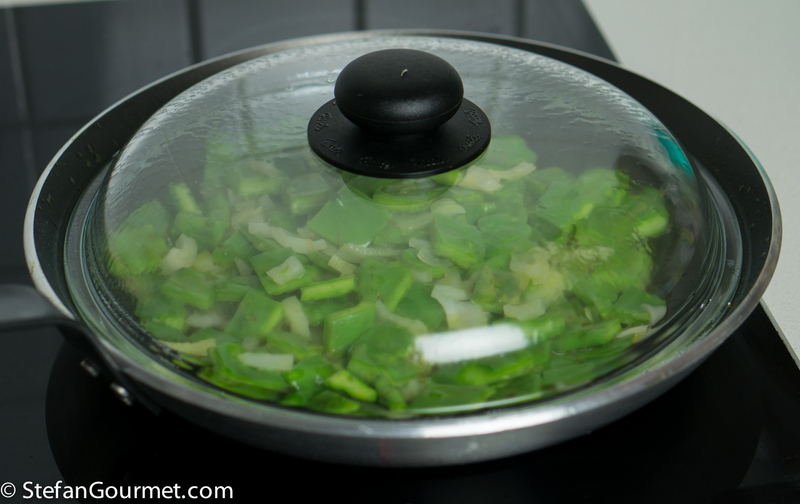 Cover the pan and cook over medium heat for 20 minutes. Stir every 5 minutes or so. 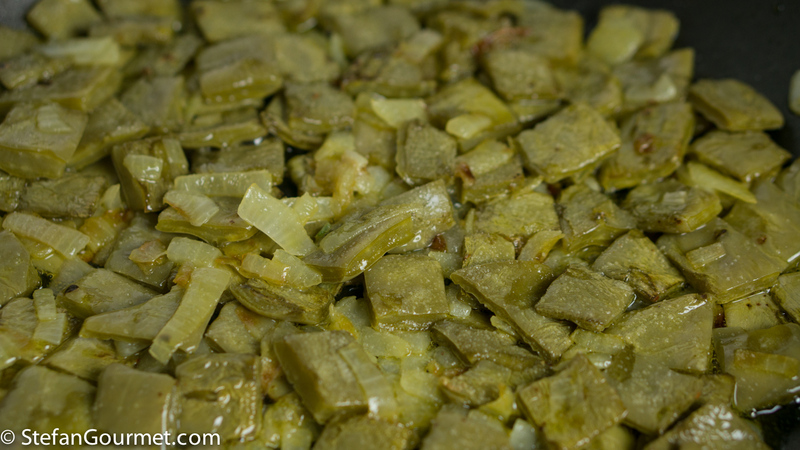 At first it will look quite slimy, but at the end of the 20 minutes it should be dry and with some browned spots. 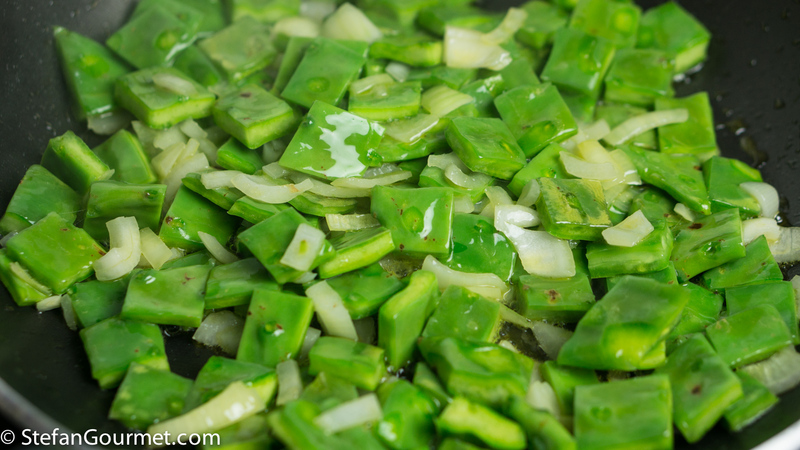 Season with salt and add a teaspoon of ground coriander seed. 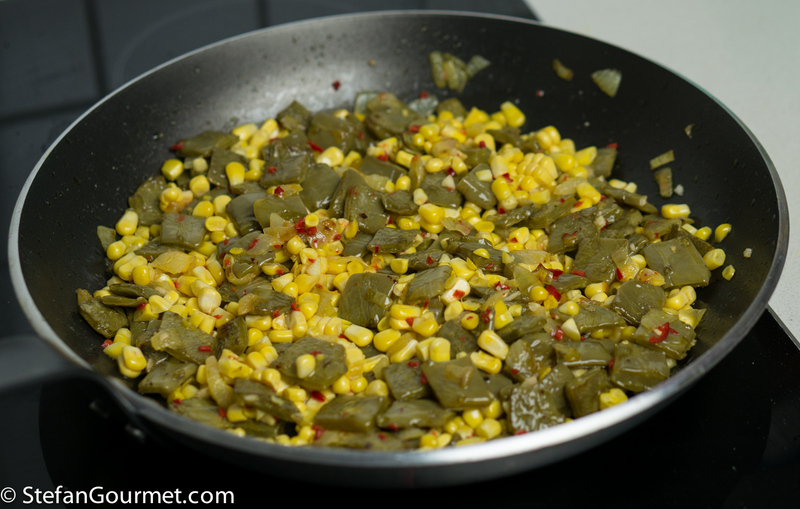 Add the corn, chilli, and garlic. 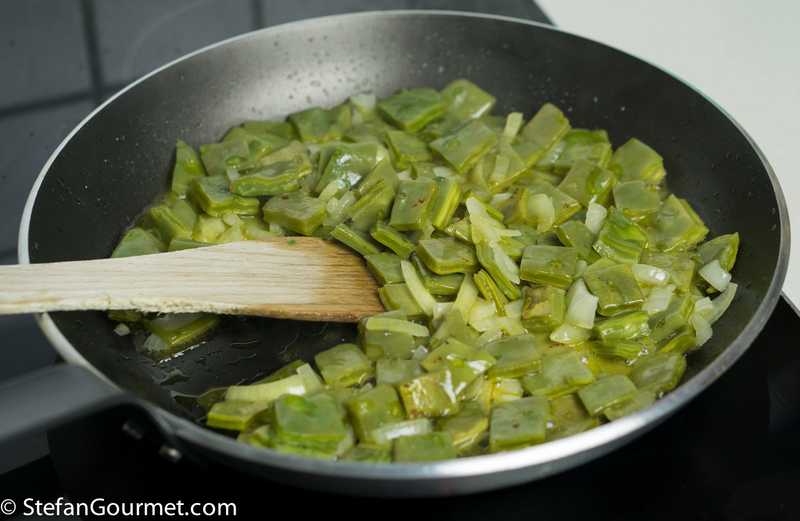 Sauté over medium high heat for 2 to 3 minutes. 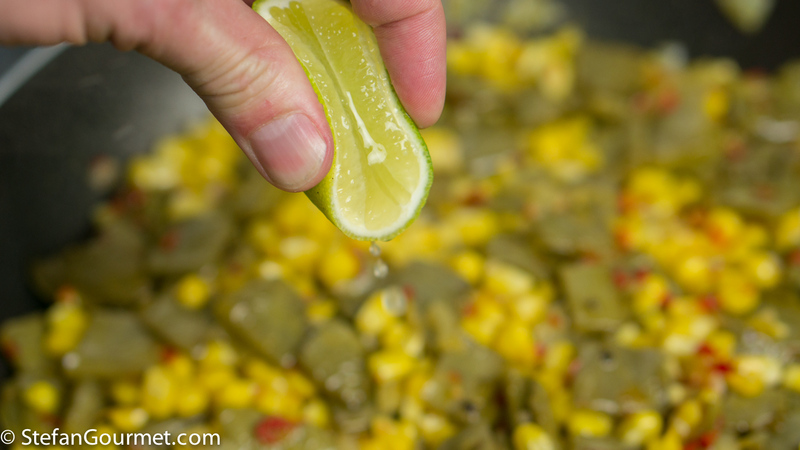 Add about a tablespoon of freshly squeezed lime juices. Sauté for another couple of minutes. Taste and adjust the seasoning with salt. 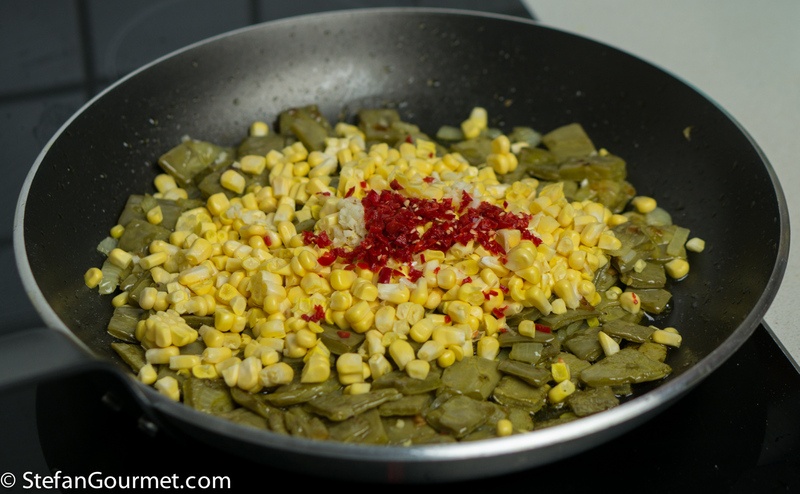 The cactus with corn is now ready to serve. 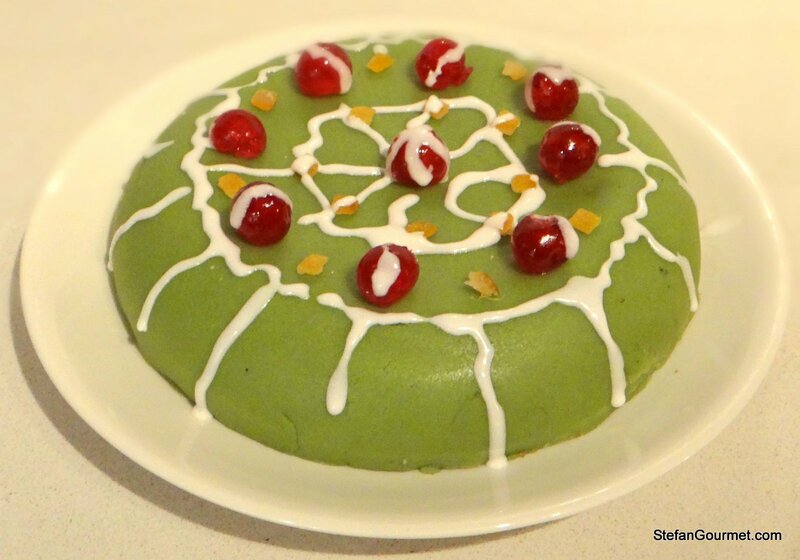 Cassata is a delicious cake from Sicily made with sweetened ricotta, marzipan, candied fruit, and sponge cake (pan di spagna). Che piatto divertente! Troppa fatica però la pulizia delle foglie di cactus! Hi Stefan. Thanks for the very nice shout out. Baby Lady and I are stoked you found fresh nopales and were able to try them. They are a fun dish and very different. We’re glad you enjoyed them and I like the addition of the ground coriander seeds. 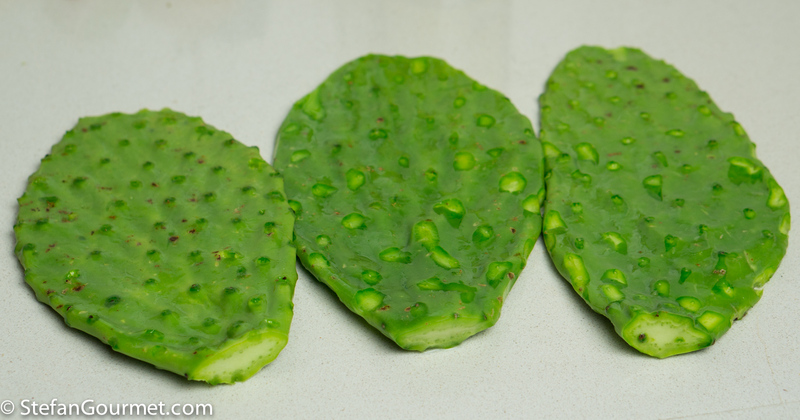 Next question: can we buy ‘cactus paddles’ in Australia? 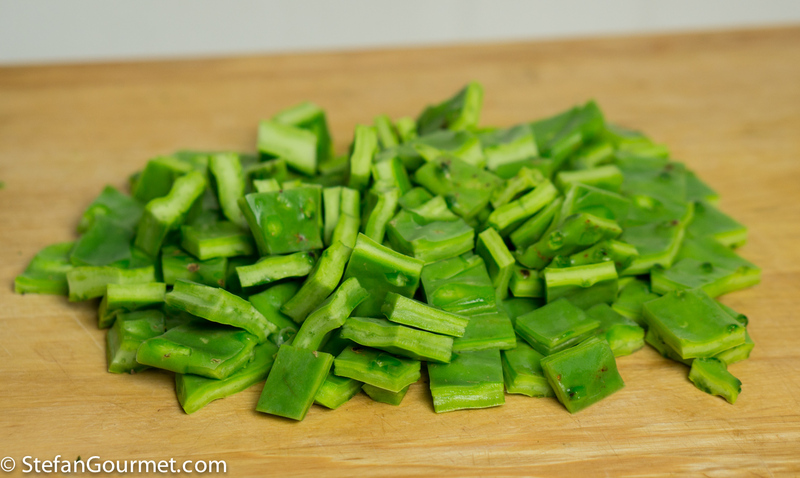 This honestly is one raw ingredient I have never tasted : frustrating when gfs living in Mexico post the wonderful meals they have had always including the cactus!! Homework! As always! I mean most of this continent is bone dry: there has to be some cactus somewhere . . .exploring . . .
Innanzitutto dove trovi le foglie di cactus e poi che sapore hanno? Piatto molto curioso. Credo ci siano dappertutto in Meriodonale. O sbaglio? Yes removing the spikes is quite a production depending on the cactus. 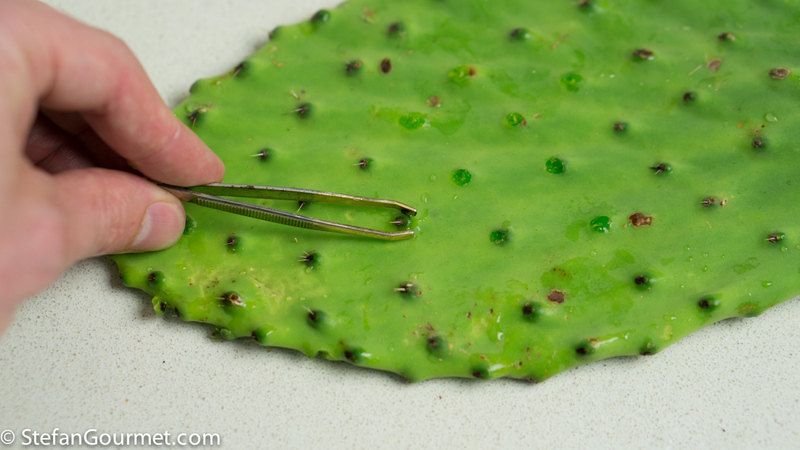 We have a small fruit called a prickly pear and they require quite a lot of preparation as the spikes are very fine and almost transparent. The fruit however is delicious. 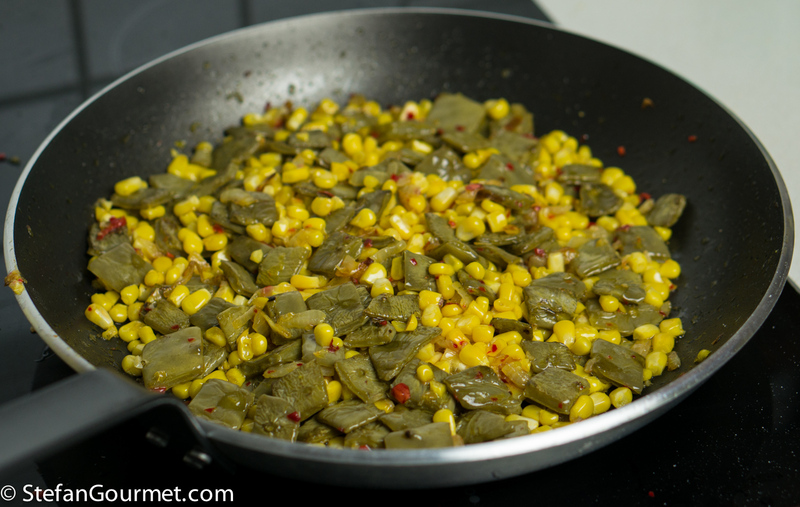 Mmm looks delicious 🙂 lucky for us Texans the nopales always come without the spines. 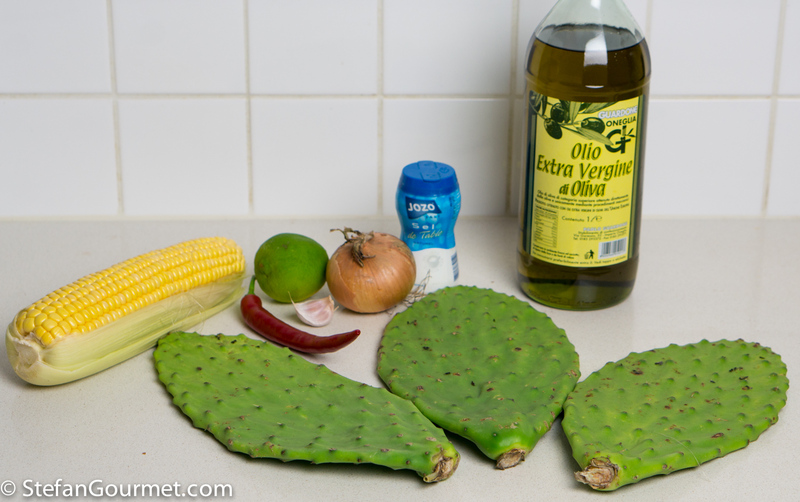 Have you ever tried the fruit that come from the cactus? prickly pears? The make the BEST margaritas 😀!! Ottima Idea Stefan. Credi che le fogllie dei Fichi d’India vadano bene lo stesso? Credo che sia la stessa pianta. Excellent. Though I suspect Richard will be surprised to see you post it. Keep them coming Stefan! 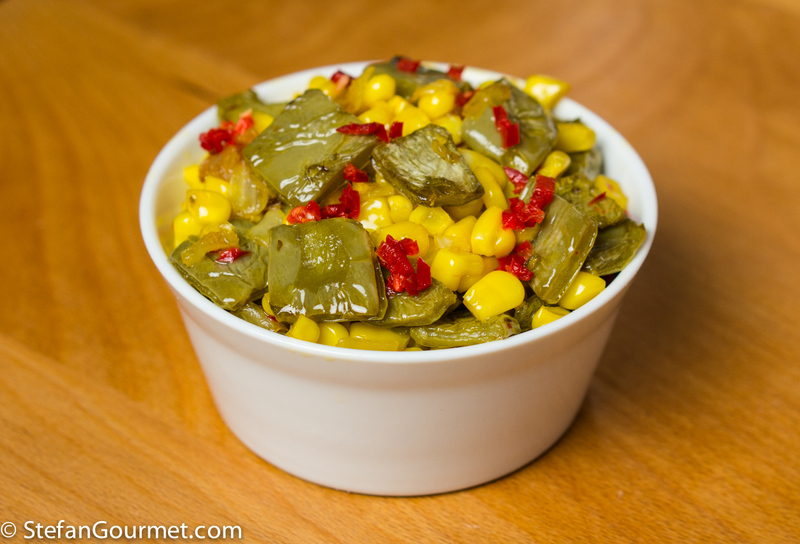 Next time try grilled nopales salad, similar to red bell pepper salad but more complex. 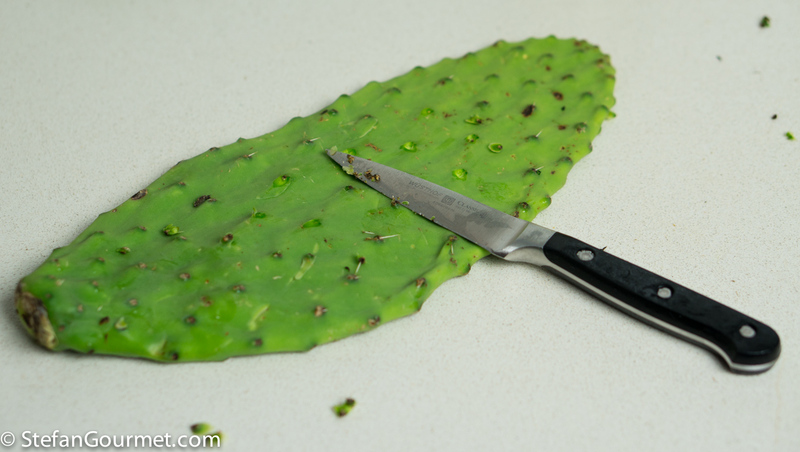 The nopales at my local grocery already takes the spines out for you! But then again, maybe they aren’t as fresh that way. My parents have loads of these “weeds” growing in their yard! Some plants are just huge! But the the local deer do a lot of trimming on them, as they love to eat them. Glad you found some, Stefan! Next time try flaming the cactus pads. It will give them more flavor, and makes it easy to “brush off” the needles. See: https://www.youtube.com/watch?v=GVbsR2seejg Cheers.